Three decades in the making, one of the most ambitious and comprehensive histories of political philosophy in nearly a century. 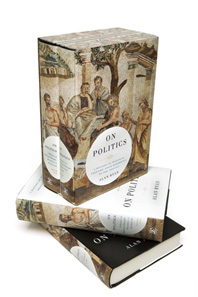 Both a history and an examination of human thought and behavior spanning three thousand years, On Politics thrillingly traces the origins of political philosophy from the ancient Greeks to Machiavelli in Book I and from Hobbes to the present age in Book II. Whether examining Lord Acton’s dictum that “absolute power corrupts absolutely” or explicating John Stuart Mill’s contention that it is “better to be a human dissatisfied than a pig satisfied,” Alan Ryan evokes the lives and minds of our greatest thinkers in a way that makes reading about them a transcendent experience. Whether writing about Plato or Augustine, de Toqueville or Thomas Jefferson, Ryan brings a wisdom to his text that illuminates John Dewey’s belief that the role of philosophy is less to see truth than to enhance experience. With this unparalleled tour de force, Ryan emerges in his own right as one of the most influential political philosophers of our time.